NEW BEDFORD, MA – ACS/Uni-Fab™, part of Atkore International, a leading manufacturer of electrical products, has expanded their line of custom electrical raceway solutions to include five different “job-in-a-box” Pre-Fabricated Device Assembly Solutions. Pre-Fabricated Device Assemblies range from basic assemblies to fully engineered systems, designed and packaged by room to reduce installation time by 60%. By making 50% or more of the connections at the factory, Pre-Fabricated Device Assemblies eliminate the need to cut branch circuit cabling and delays associated with waiting on the right components. 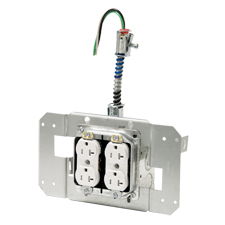 Ideal for hotels, condominiums, student housing, healthcare spaces and retail applications, the new ACS/Uni-Fab™ Pre-Fabricated Device Assembly Solutions offer rapid installation of electrical receptacles, light switches, GFCI’s and assemblies for wall and ceiling fixtures. Each assembly solution includes the right pre-assembled components packaged by room to eliminate wasted time searching for materials. This video compares a traditional hotel room installation to a fully engineered ACS Pre-Fabricated Device Assembly. Watch the contractor save up to 60% time on his installation. For more information on each solution, visit our website. ACS/Uni-Fab is a leading manufacturer of modular and prefabricated electrical products, tracing its origins back to 1984. ACS/Uni-Fab supplies a broad range of innovative, cost-saving products to the electrical industry. These products include modular wiring systems for lighting and power applications, prefabricated “room in a box” wiring assemblies, PDU assemblies, telecommunications systems, and audiovisual boxes. ACS/Uni-Fab provides products used in new construction and the restoration and modernization of commercial office buildings, institutional facilities, healthcare facilities, and more.